My love affair and fascination with Shoeless Joe Jackson, Buck Weaver and other wrongfully accused members of the 1919 Black Sox Scandal, received some credible momentum today. A pair of Chicago attorneys has conducted some thorough research into the events portrayed in Eliot Asinof’s book, “Eight Men Out” . What has long been accepted as fact may not be so and a new push is on based on legal grounds for Shoeless Joe to be reinstated by MLB and then rightfully take his place in the hallowed halls of Cooperstown. Thanks to Sports Collector's Daily for the heads up on an excellent read in Chicago Lawyer magazine. It is a lengthy 5-page read but VERY intiguing with compelling evidence to dismiss history as we have known it. "History is a collection of commonly accepted facts written by the winners, and experience teaches that once accepted, a certain perception of history is difficult, if not impossible, to correct. “Shoeless” Joe, a baseball great, is consistently snubbed for admittance into the Baseball Hall of Fame as a result of these long-standing misconceptions. 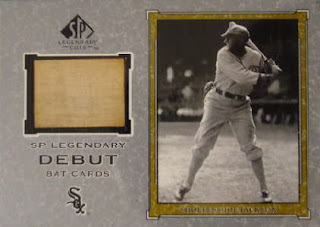 History must be corrected to reflect that Joseph Jefferson Jackson consistently expressed his innocence, and that there is no basis to blame the scandal on Comiskey as a consequence of his miserliness.“Shoeless” Joe deserves recognition for his contribution to the sport, and vindication of his name. And Comiskey deserves recognition for his accomplishments as an owner, manager, and player during the formative years of baseball, rather than as the cause of the 1919 scandal. At the very least, baseball historians and fans owe “Shoeless” Joe Jackson, Charles Comiskey, and Chicago’s Black Sox an apology." Pretty much what I've been preaching for awhile now. It's nice to see that it's getting a wider recognition. Hopefully, this helps changing some of those opinions. I too am fascinated with the "Black Sox", specifically Joe Jackson, Buck Weaver and Eddie Cicotte. I think that banning Jackson and Weaver was unfair and honestly should be overturned.They were banned for simply knowing about the fix. Other players have done worse yet were allowed to return.